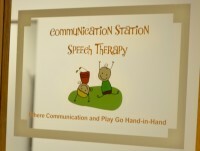 Communication Station Speech Therapy is a small patient-centered pediatric practice focused on improving not only your child's communication skills, but their ability to relate to those around them. We focus on increasing your child's communication skills while simultaneously teaching you the tools necessary to become your child's very own speech-language pathologist. Speech therapy is necessary for a variety of communication challenges which occur for known and unknown reasons. Speech-Language Pathologists are highly trained to evaluate, diagnose and treat communication disorders. Contact us today to schedule your child's screening, evaluation, or speech therapy service. Since I am currently a solo speech therapy private practice, at times, I may be in a treatment session and unable to answer the phone. Please leave a voicemail or send an email. Every effort is made to respond the same day!